Over the years, HWMO has come to understand that wildfire-related challenges are faced by a wide array of professionals and citizens, including more than just those focused on emergency response. 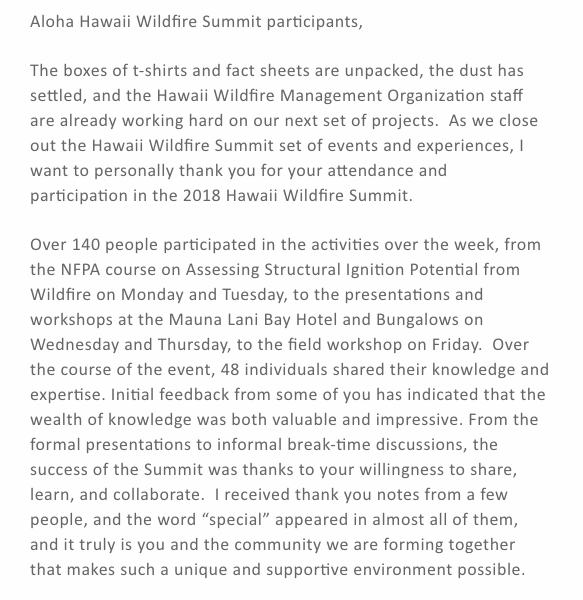 HWMO, through a grant from the U.S. Forest Service, held the first ever Hawaii Wildfire Summit between April 30 and May 4 at the Mauna Lani Bay Hotel & Bungalows to bring together not just fire professionals, but people working in riparian and marine conservation, cultural resource protection, the visitor industry, planning professionals, and community groups from across Hawaii, the Western Pacific, and the rest of the U.S. The first two days were dedicated to the NFPA course on Assessing Structural Ignition Potential from Wildfire. Participants included firefighters, land managers, and homeowners who learned the ins and outs of fire and its interaction with the built environment. Wildland fire expert, Pat Durland, who traveled from the mainland to teach the course, also shared valuable information on the latest research for improving the survivability of a home during a wildfire. 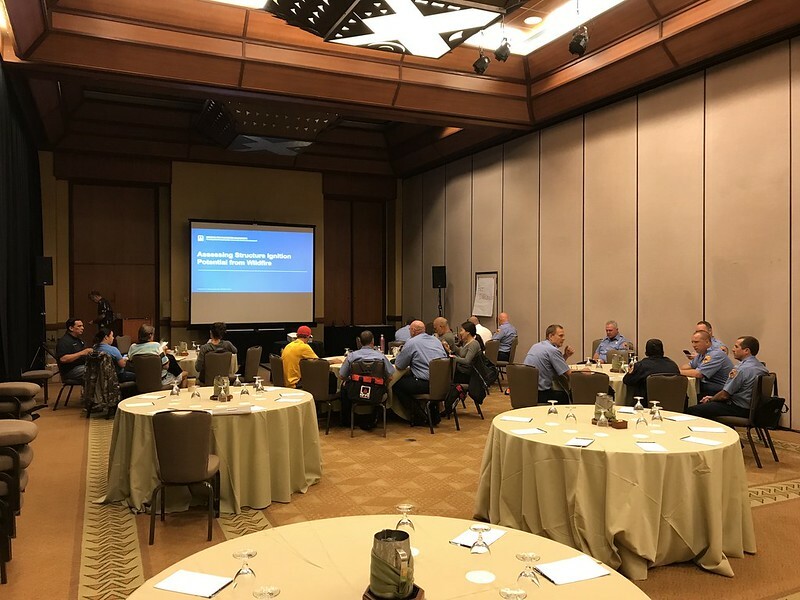 The main event began on Wednesday, May 2, kicking off two days packed with presentations and workshops from over 40 speakers, including our two keynote speakers, Gloria Edwards of Southern Rockies Fire Science Network and Dr. Steve Quarles of the Insurance Institute for Business & Home Safety. A wealth of knowledge was shared throughout the summit by these speakers with the diverse audience. Speakers highlighted lessons learned, best practices and innovations in wildfire protection. Check out the list of speakers and their bios by clicking the buttons below. * Casting ballots for a statewide youth wildfire prevention bookmark contest. Submissions were from students at Kamaile Academy in Waianae and Kohala and Waikoloa Schools on Hawaii Island. To cap off the event and to further encourage participants to use their creativity and get out of their comfort zones, we held a "Smokin' Word" open mic. Various brave volunteers, from local fire chiefs to representatives from national programs, gave spoken word performances about "why we do what we do, what we are aiming to protect, and to ignite applause and laughter." We were extremely pleased to see our colleagues dig into their creative space and shake off some nerves to share their great pieces. Professional spoken word artist (and HWMO Community Outreach Coordinator), Pablo Akira Beimler, rounded out the open mic with a performance of his poem in tribute to the summit and all of the inspiring work happening by the people in the room to make Hawaii a better, safer place to live. We also had a great turnout of Firewise Community members from Hawaii Island and Maui-- almost all Firewise Communities in Hawaii were represented! 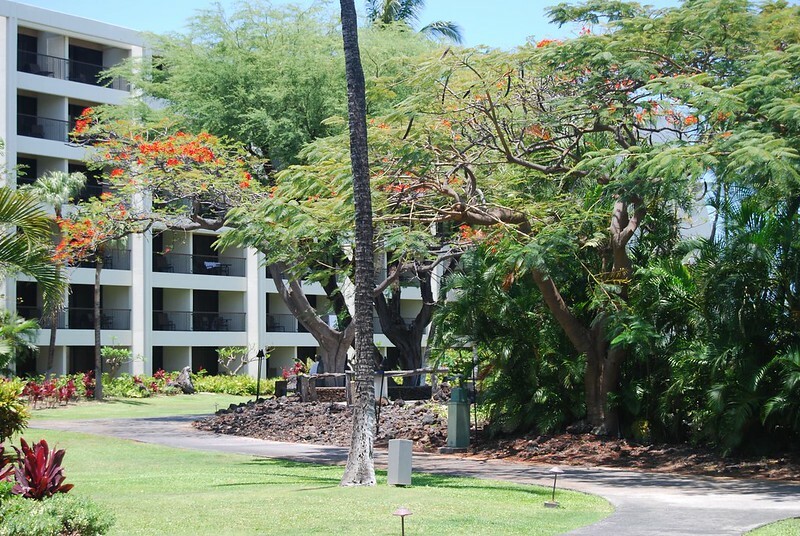 Firewise committee members Lisa Chu-Thielbar (Kanehoa), Gordon Firestein (Launiupoko), and Diane Makaala Kanealii (Honokoa) presented lessons learned and background about their Firewise efforts during the general session on the 2nd day. We had a Firewise gathering at the end of the 2nd day where participants played "get to know you bingo" to frantically and comically break the ice. From this point onward, HWMO is committed to forming a statewide peer learning network between all of the Firewise Communities. 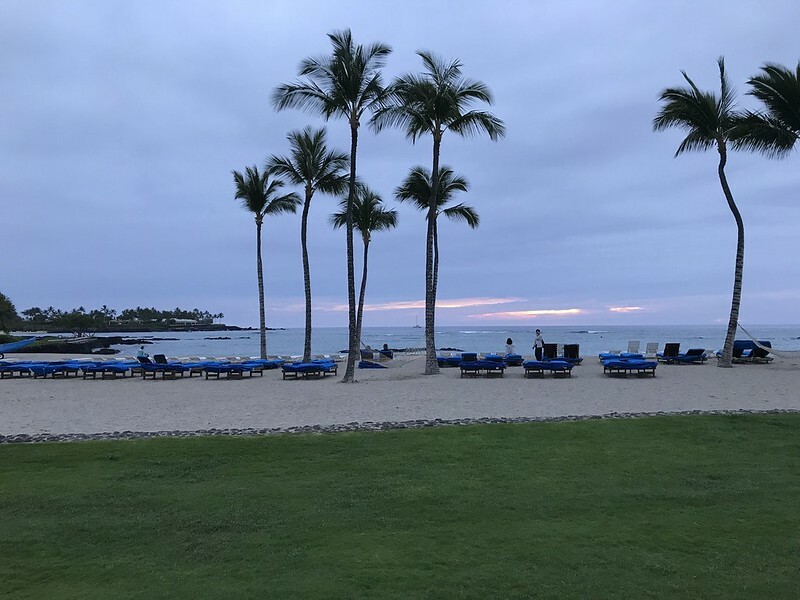 On the final day of the summit, a large group of the summit attendees hopped aboard vehicles to caravan around the South Kohala area to visualize much of what was discussed indoors at the Mauna Lani. 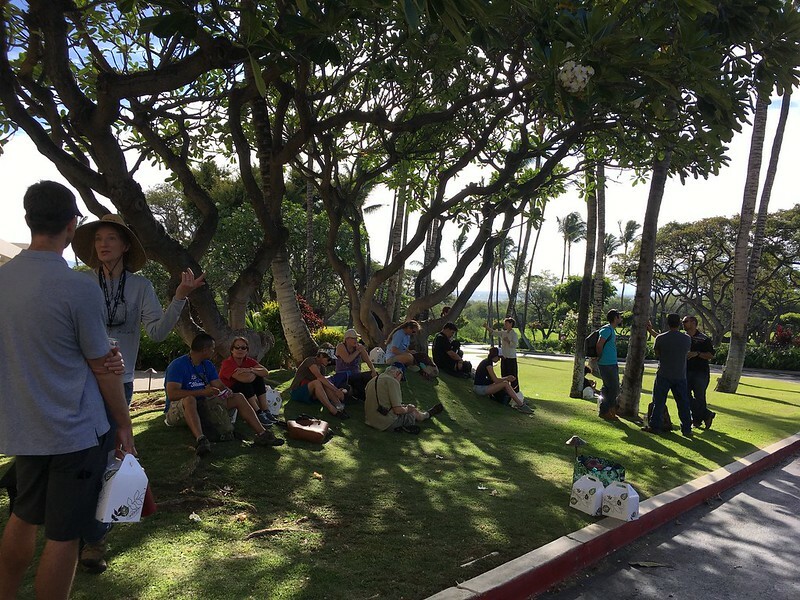 The Pacific Fire Exchange field workshop began at the Upper Waikoloa Road Intersection to ground the participants in a sense of place and seeing a landscape-level view of the summit-to-sea watersheds of South Kohala. Then, it was on to Wai Ulaula Waimea Nature Park, where participants learned about watershed planning and about the local native forest. The following stop helped participants understand the wildfire threat that threatens the native forests and the subsequent post-fire flooding that has vastly impacted Hawaii's shorelines. What better place to talk about wildfire than in Kawaihae, where the 2014 wildfire burned thousands of acres and threatened many homes, burned millions of dollars of timber, and post-fire flooding shut down businesses and impacted the livelihoods of local residents. Representatives from Hawaii County Fire Department and National Park Service shared their lessons learned from responding to the massive fire. After lunch with a beautiful view of the South Kohala Coastline and a jolt from an earthquake in Kilauea, the group walked to the Puu Kohola Heiau visitor center to learn the history of the sacred site. The group then walked along a trail to learn more about the conditions that are ripe for wildfire in Kawaihae. They continued walking down to Pelekane Bay, the site of intense post-fire runoff and coral reef decay. 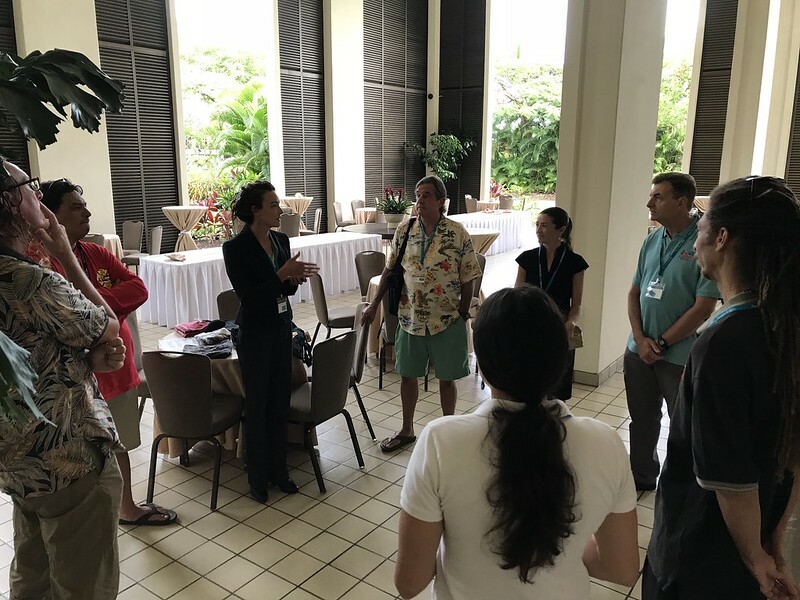 The field workshop ended in Puako where Peter Hackstedde shared about the community's efforts to create a large fuelbreak behind homes and their recent Firewise Community recognition efforts. Paniau was the final stop and a nice place to wrap-up the summit to sea discussion. 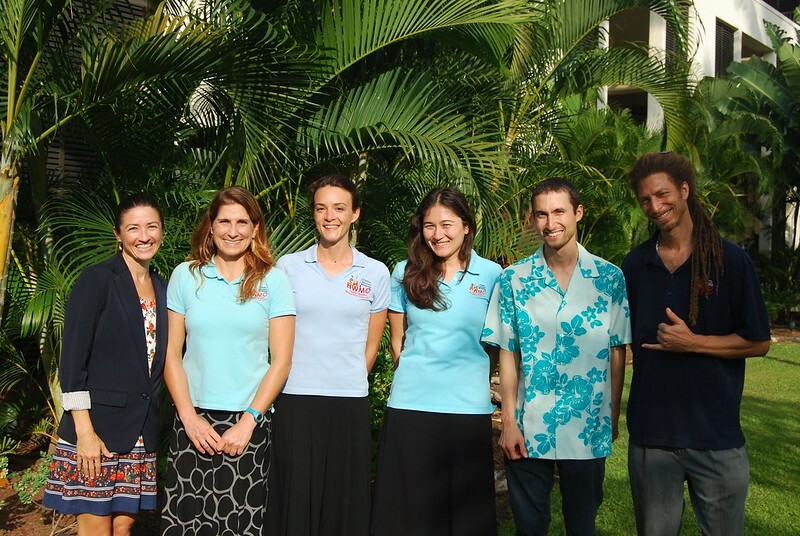 Some workshop participants stayed for a snorkel tour of the reef. Great job, Melissa Kunz, on coordinating such a smooth, exciting, and informative field workshop!